I recently bought a RF60 along with a V6II to use with my XT1 (and x100t if possible). I just managed to get Power and zoom adjustments to work via the V6II, but now it seems like the HSS mode of the RF60 is missing. As I upgraded the firmware on the RF60 along with the V6II, to the latest firmware available (mac user), the HSS mode is not available when I'm in S mode on the RF60. When in S mode I push the MULTI/HSS button but it only goes to multi not HSS. Any advice? Thank you. The X100 series camera uses a leaf shutter, so it doesn't really need HSS per se. You will be able to sync up to 1/1000s and maybe 1/2000s at certain apertures. 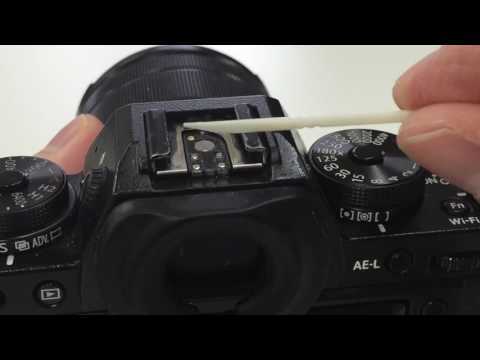 Has the hot shoe metal spring plate been removed? to securely mount the V6 II on the camera hot shoe. Try re-doing the LEARN HSS process in case it actually failed in recording the timing on the first run. Before shooting above camera's x-sync speed (1/250s on the X-T2), manually switch ON Forced HSS by pushing the Adjustment Dial. Similarily, before shooting at or below camera's x-sync speed (1/250s on the X-T2), manually switch OFF Forced HSS by again pushing the Adjustment Dial. On the RF60, you do not need to manually adjust anything to turn on HSS. It is on by default. Make sure it's the latest firmware, v2.04. Regarding the x100/s/t what is the t.1 pulse time for the rf60? I read in the manual 1/300s - 1/20.000s. Say I'm at 1/1000s shutter speed on my x100t, how do I know that the rf60 pulse stays below 1/1000s? 2. Yes, camera detected as Fujifilm, simply by turning the camera on. Securely mounted v6II on camera. 3. Done, but the flash does not fire above 1/180s on my xt1. 4. Switched on, flash does not fire above sync speed (valid for both ON and OFF). 5. Done, flash fires below and at sync speed (1/180s) when OFF, not when ON. 6. I only use one V6II, on camera. Try doing a factory reset and see if you can detect the camera as Fujifilm. I doubt you are able to get the V6 II auto-detect without half pressing the camera shutter button. So maybe you once manually selected the camera system as Fujifilm? We recommend you to remove the metal plate, before trying anything else. It's set to auto detection and it works for both my x100t and my xt1. What do you mean by removing the metal plate? Technically speaking you don't need to auto-detect your X100T since it uses a leaf shutter. You only needed the centre hot shoe connection on the V6 II as it does not have a maximum x-sync speed. Please let me how you get on. Thank you! Thanks, I removed the metal plate and now the flash fires at higher shutter speeds. However I haven't got a shot without partial black frame. Any thoughts? And btw, I get the thing with the x100t, I've been using its leaf shutter for flash work several years now. FYI shutter timing on most (if not all) Fujifilm X cameras changes all the time. So the moment V6 II learns a timing may not be the one it uses when you take the actual shot. Right, so as you know leaf shutter camera does not have an x-sync speed, so nor would HSS be in its dictionary. So essentially tou are using the V6 II as a manual trigger. Like the original V6 it can support up to 1/1000s.